Will Circus Elephants Ever Get Their Blackfish Moment? 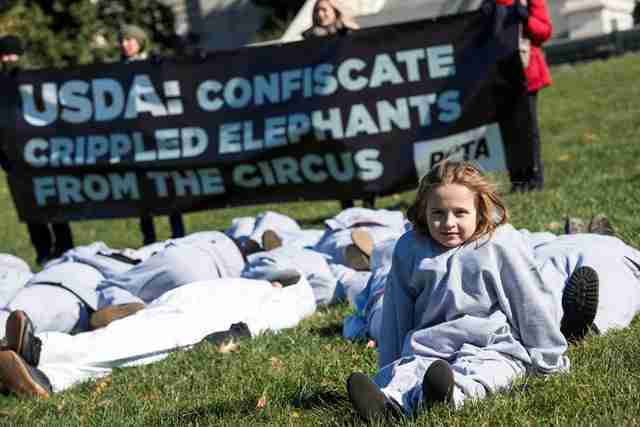 Earlier this week, PETA staged a demonstration in Washington, D.C. Staffers dressed in fluffy gray sweat suits, huddled together, and arranged on the ground under a banner which read: "USDA: Confiscate Crippled Elephants from the Circus." They were splayed on the grass in the shape of an elephant. The crippled elephant at the center of the protest is a female pachyderm named Nosey. According to numerous articles, petitions and blog posts, Nosey is suffering abuse and neglect from her owner and simultaneously crumbling under her wrenching arthritis (chronic foot problems and musculoskeletal disorders are one of the leading causes of deaths for captive elephants). Despite this, her Florida-based owner Hugo Liebel is towing Nosey from city to city so she can lug gobs of children on her back. Furthermore, according to PETA, Liebel has been slapped with a grand display of Animal Welfare Act violations over many years - 200 violations. Meanwhile, PETA argues, the USDA is being "unresponsive" to Nosey's plight. "We have been complaining about Nosey for more than a decade," says Rachel Matthews, council for the Captive Animal Law Enforcement Division for PETA Foundation. "PETA has supplied the USDA with documentation that Nosey is lame. The USDA has the authority to seize animals who are suffering under exhibitors and can revoke or suspend an exhibitor's license. And the USDA has taken no action on behalf of Nosey." Nosey is one of 99 elephants in American circuses. And the protest on her behalf comes at a time when another captive mammal is receiving a far more spectacular amount of support: Tilikum, the orca subject of the explosive documentary, "Blackfish." This one movie has managed to not only blow the door wide open on the issue of orcas in captivity, but has galvanized a once-sleepy public into a rabble-rousing mass of freedom fighters calling for SeaWorld to release its grasp on an entire species. So, the question is: Why aren't circus elephants having the same rush-to-rescue moment as captive orcas? Does the enormous amount of attention thrust to the orcas' struggle really come down to just one film? Part of the reason circus elephants haven't seen a call to arms might be due to the surprisingly long and entrenched history elephants have had in this country. Susan Nance is a U.S. historian at the University of Guelph in Ontario and author of "Entertaining Elephants: Animal Agency and the Business of the American Circus." Nance says the first elephant - a female - arrived in the U.S. more than two centuries ago - back in 1795. 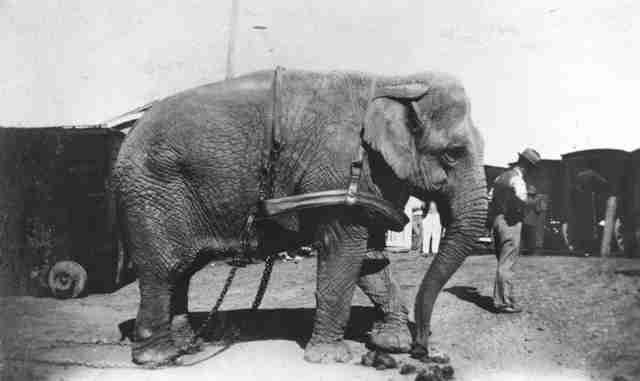 And when the American circus was born in 1850, "[they] included elephants right from the beginning." Elephants suffered tremendously in the circus (and according to many circus observers, still do). Every elephant that was in the circus in the 19th century, says Nance, actually died in the circus; "None of those elephants made it to old age," she adds. When or if the elephants were "unmanageable," she says, they were killed: shot, poisoned or even strangled to death. In a desperately sad twist, in order to strangle an elephant, "it involved getting other elephants to pull the ropes around the elephant's neck." Many circus elephants were actually killed in public settings. Not only were elephants killed, but elephants also killed people. And in another morbid twist, this became something of a thrill; "By the late 19th century, the fact that you might see an elephant kill someone would actually be an appealing reason for some patrons to actually go to the circus." Beyond the violence, there were other concerns, as well. Workplace safety hazards became an issue, "and the public was angry at that." In fact, Nance continues, "When I saw ‘Blackfish,' I thought [in terms of circus elephants] for crying out loud it's the same story! If I hadn't had my book in production when I saw that film, they would have thought one of us plagiarized each other! It was the same exact storyline: Put the animals in captivity. Then, they get bigger. Someone gets killed. Someone tries to cover it up. The public finds out. And they get really upset." One of the other reasons Nance speculates circus elephants haven't had their Blackfish-moment might come down to socio-economics. "SeaWorld is expensive. It costs a lot to go. But Feld Entertainment - which owns Ringling Bros., Barnum & Bailey Circus and Disney on Ice - refers to itself as a 'Walmart' for entertainment: it has a working class audience. 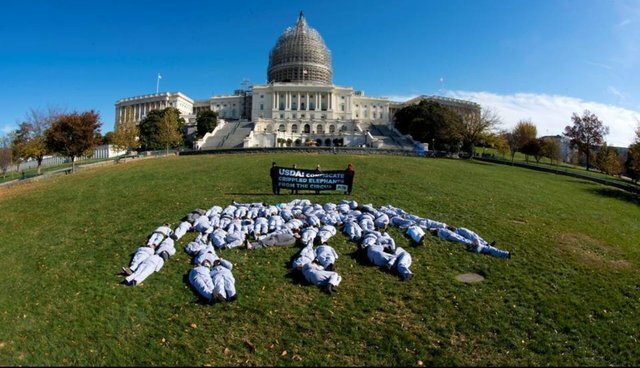 Historically, in the United States, it is the middle and upper classes which motivates animal welfare movements." This difference in audience demographic might be a determining factor in the different outcomes for elephants and orcas in captivity, she suggests. Journalist Carol Bradley has also spent a great deal of time researching circus elephants for her book, "Last Chain On Billie." (Bradley was quoted in a recent piece in The Dodo on two circus elephants, Rosie and Opal.) Bradley also sees a many reasons why circus elephants haven't had their Blackfish-moment. "I believe a growing percentage of the public [in fact] does feel queasy about seeing captive wild animals performing in a ring, even if they can't articulate why. People will ask: if elephants are so abused, why isn't there a law prohibiting it?" "They don't understand," she explains, "that there is a law, the federal Animal Welfare Act. But it is weakly written and poorly enforced." 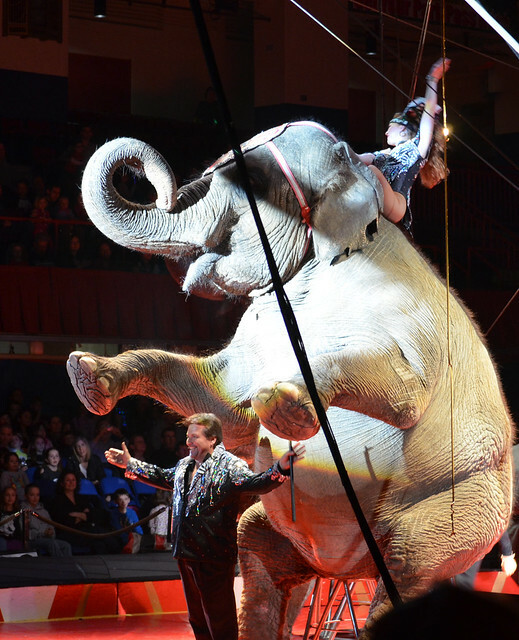 For example, says Bradley, "The Animal Welfare Act allows elephant handlers to use bullhooks and, even when there are obvious injuries to elephants, there are too few federal inspectors to monitor their welfare." Moreover, Bradley says the circus industry is a financial powerhouse and is very effective at lobbying: "Circuses have spent millions of dollars trying to paint protestors as left wing nut jobs ... According to the group Center for Public Integrity, Ringling Bros. spent $335,000 in 2012 alone lobbying Congress and the federal government not to clamp down on circuses." Lastly, Bradley says that for the public, it's hard to imagine that elephants - the largest terrestrial animal - would do a trick on a stage if they didn't want to. "They trot out into the ring of their own accord and actually seem to be smiling as they go about standing on tubs, balancing on their front legs and so on. The public isn't aware that elephants undergo training from the time they're babies, when they are very vulnerable. They can grow to be 8,000 pounds - but still fear the bullhook and the trainer carrying it." With or without a pivotal documentary, animal-welfare campaigns have a life of their own. Jennifer Fearing, the President of Fearless Advocacy, Inc. based in Sacramento, CA and a seasoned lobbyist for animal protection measures with the Humane Society of the United States (HSUS). Like Bradley, Fearing says she sees a general level of awareness and concern for circus elephants, "but it hasn't popped," she says. "I have seen pockets of success." She points to the recent L.A. city council ban of bullhooks; "Since Ringling said plainly that they need bullhooks to bring circus elephants to the city, the L.A. leaders voted unanimously to not have the circus anymore. It comes into effect in January 2017. That's a long time. And as someone who has seen phase-outs take place, there is time for mischief and litigation and reversal. So until it is done, it isn't done." But, she says, the circus elephant issue is "certainly simmering. And L.A.'s step undoubtedly adds momentum. Oakland has the issue on its docket and will take it up in December." Fearing explains that campaigns often have fits and starts. Or long periods of dormancy. "Groups have to be nimble." And like Bradley, she acknowledges Feld Entertainment is a formidable foe. In that sense, organizations often need to weigh their "scarce" resources against a cause. For example, Fearing notes that many welfare and conservation groups are putting a significant amount of energy into elephants in Africa right now, victim of an unmerciful poaching onslaught. "Nothing happens in a vacuum," Fearing emphasizes. "Unfortunately, there are a host of animals - including elephants - in peril. And efforts get spread thinner than anyone would like." Still, things can shift. And almost nothing shifts a movement like the power of the purse. "SeaWorld is a public company. And we are all watching what looks like a financial train wreck. Their stock is down 50 percent this year. This means when their shares go down, it's pretty unlikely someone is going to buy them." With SeaWorld's orcas, she argues, the audience and consumer demand may just handle the issue: "The market is crashing." "People vote with their wallets," Fearing maintains. Elephants might have their Blackfish moment if people stop going to the circus. "And then," she says, "it just might crack."